The Georgio Armani Privé Paris Haute Couture collection spring/summer 2015 features bamboo motifs. There is a short video clip here. I haven’t had the opportunity to see ‘The Tale of The Princess Kaguya’ yet. There are lots of very good reviews (and I haven’t seen anything from Studio Ghibli I didn’t like). DVDs of the movie are available on Amazon . 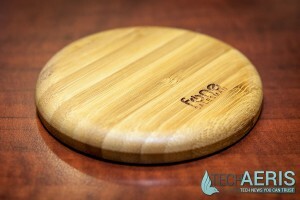 Also on Amazon, these lovely looking bamboo placemats average 4 and half star reviews. Easy to clean and stain resistant, they say. What more could you want in a placemat? 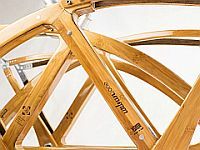 Materials to compliment bamboo for bikes: A UK-based bicycle designer and manufacturer has fused flax with bamboo to produce a composite material that is as strong or stronger than carbon, aluminium or steel bike frames. And the frame weighs in at just 3.3 kg. More interesting details here. Bamboo Qi wireless charger. It looks gorgeous. I want one. Amazon customer reviews are very favorable. You can read a Tech Aeris here, and buy one on Amazon here . To finish off this month of Bamboo on the Internet I leave you with a lovely way to while away a half hour: The Intricate Process Of Making Arrows From Bamboo. 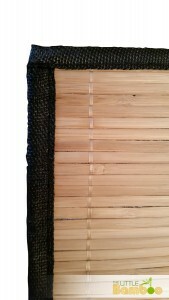 This entry was posted in All, Bamboo around the world, Bamboo craft and tools, Bamboo on the Internet, Bamboo product reviews on 07/03/2015 by Deb.